Jun.17, 2014: Angus -> EF2 Barrie tornado + Stroud EF1 tornado - Ontario Storms Site! I don't want to jinx anything, but at this moment (10 a.m.) E.C. has a special weather statement out, TWN has a few stories out and the SPC has us in the slight category. Currently there are some storms in Bruce/Grey counties with more over Michigan. This day could be quite interesting. Severe thunderstorms possible later today. A fairly potent disturbance is approaching Southern Ontario from the west, with showers and thunderstorms affecting parts of the us midwest into lower Michigan. A warm and humid airmass will be in place across the regions today, with afternoon temperatures peaking in the upper twenties to lower thirties, and humidex values in the mid to possibly upper 30S. As this disturbance gets closer, showers and thunderstorms will spread into Southern Ontario this afternoon. Heavy downpours, frequent lightning and gusty winds will probably be associated with many of the thunderstorms. Latest indications suggest that conditions may become favourable for some of the thunderstorms to become severe this afternoon into this evening. The main threats will be torrential downpours, damaging winds and large hail. Environment Canada is closely monitoring this situation. Watches and warnings may be issued as required later today as this event draws closer. The public is advised to monitor future forecasts and warnings as warnings may be required or extended. i'll be watching from Midland today aswell. this is the highest probability so far this year if im recalling correctly. a good line is coming our way right now, just getting darker here. Watch is up for all of Southwestern Ontario. Severe thunderstorm conditions possible - late morning to evening. Conditions are favourable for the development of dangerous thunderstorms that may be capable of producing strong wind gusts, damaging hail and heavy rain. There is also a risk of a tornado. The threat of severe thunderstorms exists until this evening. Very large hail can damage property, break windows, dent vehicles and cause serious injury. Strong wind gusts can toss loose objects, damage weak buildings, break branches off trees and overturn large vehicles. Remember, severe thunderstorms can produce tornadoes. Be prepared for severe weather. Take cover immediately, if threatening weather approaches. 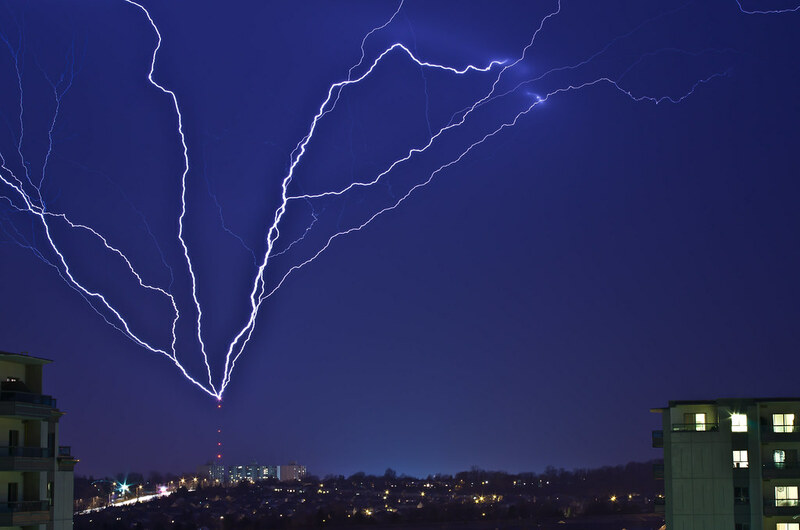 In Canada, lightning kills up to 10 people every year. Remember, when thunder roars, go indoors. Environment Canada meteorologists will update alerts as required, so stay tuned to your local media or Weatheradio. Email reports of severe weather to storm.ontario@ec.gc.ca or tweet with the hashtag #ONStorm. Updated or ended by 12:05 p.m. EDT. At 10:36 a.m. EDT, Environment Canada meteorologists are tracking a severe thunderstorm capable of producing very strong wind gusts, dime to ping pong ball size hail and heavy rain. Several strong storms ase moving from west to east through the regions and will intensify over the next hour or two. Take cover immediately, if threatening weather approaches. Large hail can damage property and cause injury. Strong wind gusts can toss loose objects, damage weak buildings, break branches off trees and overturn large vehicles. Remember, severe thunderstorms can produce tornadoes. Go indoors and move away from windows and skylights. Avoid areas of the building that could be affected by falling debris such as tree limbs. In Canada, lightning kills up to 10 people every year. Remember, when thunder roars, go indoors. I've even circled the spots on the maps by judging the nasa satellite loop by seeing here storms will light up..and have been right so many times..giving me a lot of confidence in my ability to understand where and when a storm will form. I see the setup i think your refereing to Raedwulf, i have been sceptical because of the low convection models i saw earlier for that timeframe but i am seeing some cells toward the bottom end of that line starting to organize, as well my model suggests perhaps another wave forming afterward towards the overnight period with a good swath sweeping across southwestern ontario. my confidence in my outlook though is low, id say 30% because im expecting this first wave to take away a lot of potential energy from the system, I hope im underestimating it. Updated or ended by 3:01 p.m. EDT. A developing line of storms over Lake Huron will cross the regions this afternoon with heavy rain, wind gusts to 100 kilometres per hour and damaging hail 2 to 4 centimetres in diameter possible. Take cover immediately, if threatening weather approaches. Fast moving water across a road can sweep a vehicle away. Large hail can damage property and cause injury. Strong wind gusts can toss loose objects, damage weak buildings, break branches off trees and overturn large vehicles. Remember, severe thunderstorms can produce tornadoes. Go indoors and move away from windows and skylights. Avoid areas of the building that could be affected by falling debris such as tree limbs. Avoid driving through water on roads. Watch for possible washouts near rivers, creeks and culverts. In Canada, lightning kills up to 10 people every year. Remember, when thunder roars, go indoors. Tornado conditions possible - afternoon to early evening. Sev ere storms will develop rapidly this afternoon with the potential to become dangerous due to strong winds, large hail and there is the possibility of a few tornadoes.